People become agitated and worried when they get a missed call from an unknown phone number. They keep asking themselves this question “whose number is this?” Well, if you have a smartphone, you can easily find out the details of the unknown caller with a reverse phone lookup app or service. A reverse phone number lookup tool uses a special command to fetch the details of the person from a database containing millions of numbers. The Internet provides access to 100s of good reverse phone lookup tools. If you’re searching for an app which provides the functionality of providing unknown number details, download one of the following apps. Truecaller is an ultimate app to find details of a person calling you for an unknown reason. Over 100 million people across the world use Truecaller every day. The best thing about TC is that it has records of users who don’t use Truecaller. The app provides a great interface and experience on mobile phones. It has caller ID feature which popups up whenever you get an incoming call. The popup shows the name and location of the person. It has the option to block the number if it is unknown to you or not in your contact list. The Truecaller reverse phone lookup app features a well-designed dialer interface, which you can set it as your default on the phone. It is a powerful tool which replaces the phone number with the person’s name. If the person’s photo is available, Truecaller shows the caller’s photo as well. TC dialer groups phone numbers by days. It has a search button which gives you access to the reverse phone lookup tool of Truecaller. To use this feature, enter the name or mobile number of the person. Once you find the name and location of the person, you can visit the local police station and file a complaint against him/her. You can also request your brother, husband, friend to warn the unknown person not to call you again. 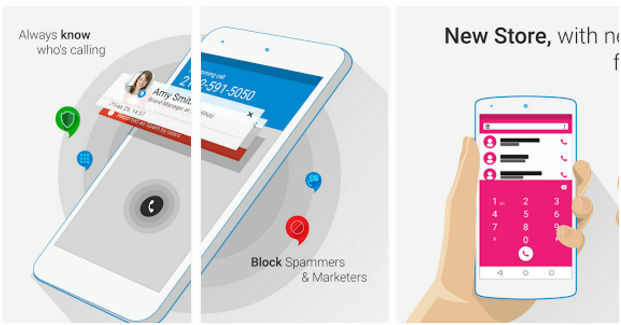 Apart from the reverse phone lookup feature, Truecaller functions as a powerful spam blocker app. It maintains a huge list of spammers and blocks them automatically when you enable spam blocking feature in Truecaller. Truecaller reverse phone lookup app works only when you’ve verified your mobile number. It supports two methods of verification i.e. SMS and phone. Ringtone composed by a known musician. I am using the Truecaller app as a default tool to block spammers and find details of a caller. It’s a great app which works in the background using a minimal amount of RAM. Mr. Number is yet another popular reverse phone lookup tool which detects and makes you aware of the phone numbers of scammers and fraudsters automatically. The app allows you to block annoying marketing calls, which are made for only one purpose, sell a product or service. Mr Number lets you block numbers which are marked as unknown or hidden. It has the option to block numbers by marking them as spam. Once you block a phone call, the app takes the information you’ve provided into account and makes other users aware of the scammer. Mr. Number has auto phone number lookup functionality which helps users identify fake and known callers. Number Guru is a useful application for the users residing in the United States. The app takes a phone number of the person as an input. After entering the number, users must tap the search button to get details of the caller. Once you click or tap the search option, Mr Number App performs reverse phone lookup operation and makes you aware of the caller’s Geo-location, city, name, and other vital details. Number Guru is a free service and it is accurate as well. It lets users mark a number as spam. If some other user has reported the number, NG app will make you aware of it. The app covers 100% landline numbers in the US. It supports Verizon Wireless numbers and has free unlimited usage policy. 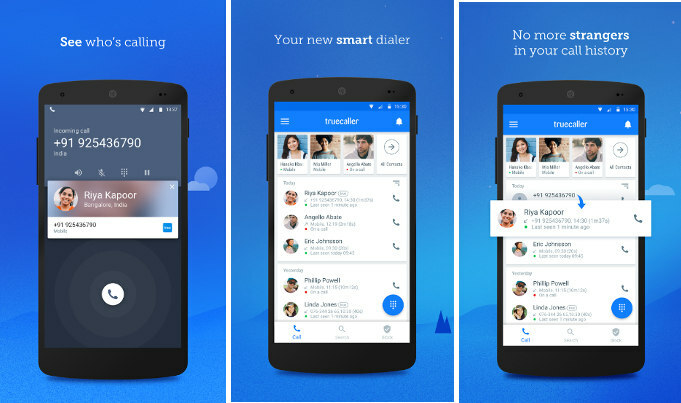 CallApp is a great alternative to TrueCaller. According to its developer, the application fetches user details from a large database containing over 500 million phone numbers belonging to people of 10 different countries. The app can retrieve the caller’s information from social networking sites like Twitter, Facebook, etc. It shows the photo and full information of the caller. You can configure the application to block spam numbers automatically. If the number isn’t blocked by CallApp, you can add it to the blacklist. Unlike other apps, CallApp can block messages from senders on popular instant messaging apps. CallApp allows you to search phone numbers by their name and it provides a powerful call tracker feature that prevents threatening calls. Note: The latest edition of Google Phone app has span prevention function built-in. 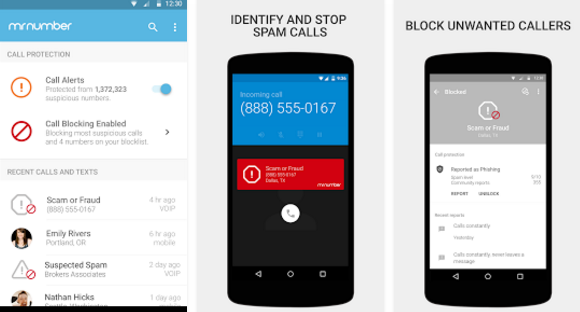 If you’re using a dialer app of some other country, it’s time to try out the Google Dialer. 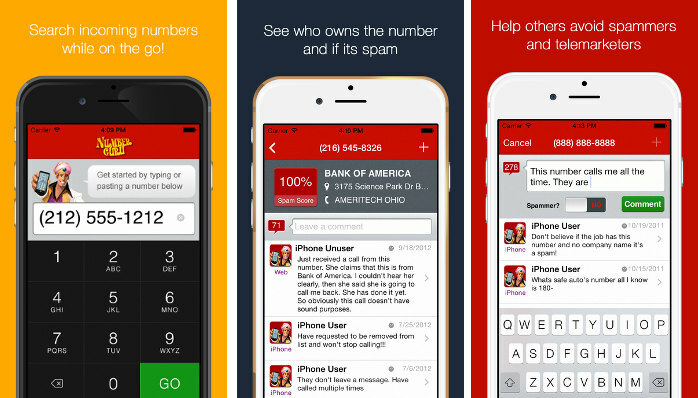 GD lets you block calls and report spam numbers. Eyecon caller ID app is a great alternative to the above four applications and Google dialer. Conclusion: Don’t worry if your mobile shows plenty of unknown number alerts. Just download one of the apps we have mentioned above, and configure them to block spam numbers. Check the applications from time to time. Top 6 Best fighting games for Android	How to clear YouTube app history on Android or iPhone? I personally use CallApp for this since I already use it for caller ID. Why did this one not make your list? NumberGuru is no longer free. There is a “5 day trial” for $1, but after the five days it is like $25 per month, automatically withdrawn from your bank or credit card. I left a message with their customer service a few days ago to cancel my membership, and have yet to receive confirmation.